When USD, Inc. made the move away from independent contract drivers and brought its delivery fleet in-house over a year ago, the company’s management team decided to incorporate as many alternative fuel vehicles as possible going forward. In 2013 alone, the company added 20 Westport WiNG™ Power System Ford Transit Connects operating on dedicated compressed natural gas (CNG) to its fleet. USD is the leading distributor of original equipment Ford, General Motors and Chrysler automotive parts in the southwest United States. Operating for 42 years, with corporate headquarters in Phoenix, Arizona, USD also has facilities in New Mexico, Texas and Colorado. 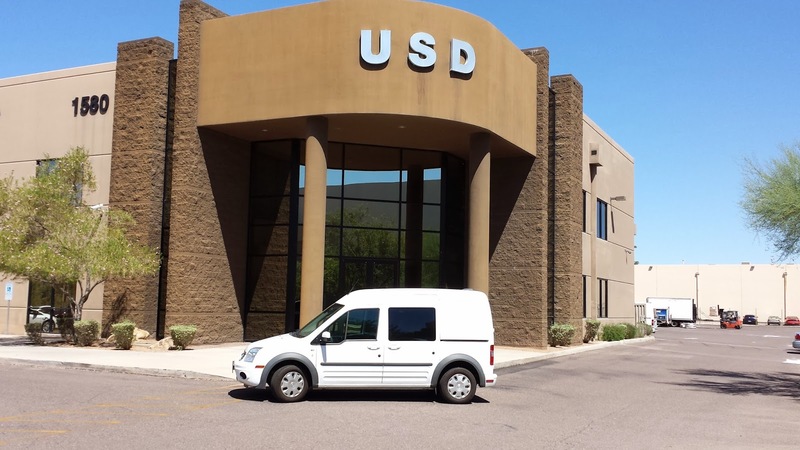 USD has a fleet of 30 vehicles used for parts delivery with each vehicle driven approximately 250 miles and making four to five runs per day. In an effort to promote driver retention with the company and to encourage drivers to maintain their vehicles, USD has developed a unique compensation program. After four years with the company, when their assigned vehicle reaches the end of its useful life for everyday company use, drivers will have their vehicle signed over to them as a length of service award. Looking ahead, the company plans to expand its fleet in 2015 with the addition of either more CNG powered Transit Connects or Ford pickup trucks, making their fleet almost entirely made up of CNG vehicles. Labels: Ford Transit Connect, USD Inc.